Buy the Farm . . . Share: Passover Chain Fight! Tonight was the Wombats' first Passover. Sadly I couldn't figure out a way to make them a particularly Passover-y mashed dinner. I briefly considered crumbling up matzoh to mix in but I figured having sharp cracker shards in their meal may not be a great parenting move. Instead I opted for chicken, kale, and acorn squash with rice cereal. No sharp objects or choking hazards. 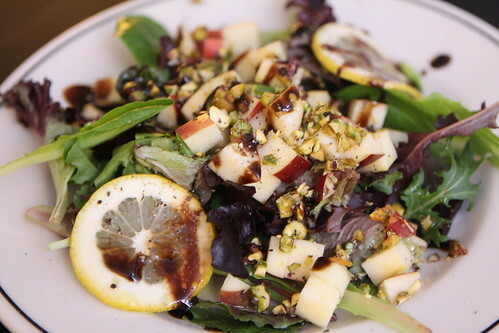 For salad I started us off with chopped apples, mixed greens, pistachios, lemon, and balsamic glaze with olive oil, salt, and pepper. 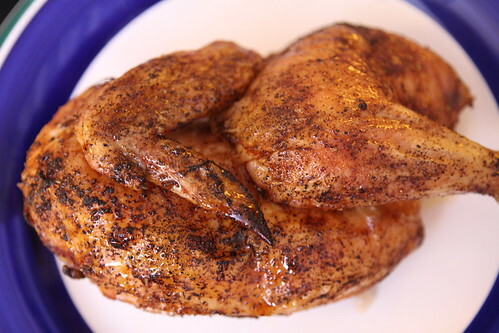 I also roasted a chicken which I seasoned with a BBQ rub then drizzled with lemon and honey. 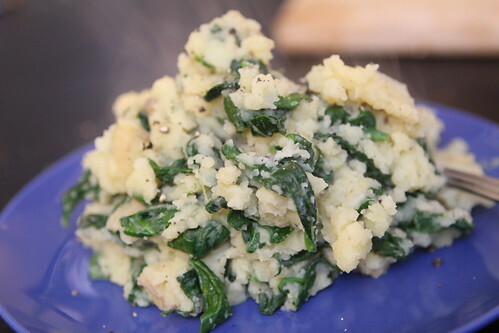 As an accompaniment I made these olive oil mashed potatoes with fresh spinach, salt, and pepper. 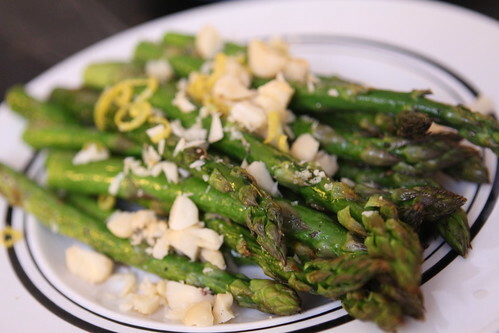 Also, I roasted some great California asparagus with lemon zest and chopped macadamia nuts. To pair with tonight's dinner I tried looking for a He'Brew beer I haven't had before at the local beer store. Sadly there was nothing there that I haven't had. 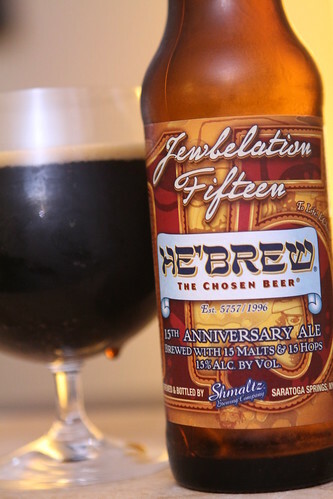 Instead I went to the beer cellar and came out with this He'Brew Jewbelation Fifteen from Shmaltz Brewing Company. I picked this one up some time in 2011 and it had been aging for probably about eighteen months. Each year they brew an anniversary ale using the number of the anniversary for the number of malts, hops, and ABV. This version was brewed with fifteen malts, fifteen hops, and weighs in at a heavy fifteen percent alcohol. The resulting beer was pretty amazing. It was extremely complex but far smoother than I would have thought for fifteen percent alcohol. I thought I wouldn't be able to finish the whole glass but after sipping it I actually felt far less affected by it than I would have imagined. I felt like I could have easily had a second beer, just not a Jewbelation 15. Maybe something in the 5-6.5% range. While we struggled to get through our dinner before the babies lost their minds they enjoyed a time-honored Passover tradition: Baby Chain Fight! For dessert I made matzo crunch, one of my favorite dessert items. 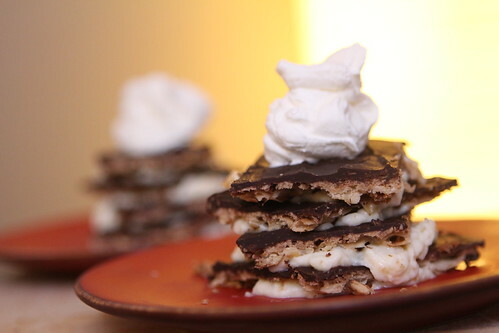 To make it a little different this year I combined it with vanilla custard to make a version of Jen's "Napoleons" by layering it with the cracked matzo crunch and topping it with whipped cream. Kosher? No. Delicious? Yes.